Your health is impacted by the choices you make. Learn how chiropractic care can help. Living with less pain is great, but returning to the activities that pain was preventing is life changing. Combining 35+ years of experience, an incredible staff, and the latest research and technology; Adams Chiropractic is suited to be a tremendous fit for you and your family with Dr. Kurt and Cole Adams. Save 20 minutes on your first visit! Our new patient forms are available here so you can thoroughly complete them in the comfort of your own home. Thank you for visiting the website of Silverdale chiropractors Dr. Kurt Adams and Dr. Cole Adams at Adams Chiropractic. We are conveniently located on Anderson Hill Road just off Silverdale Way. Team members at Adams Chiropractic are dedicated to helping you achieve your wellness objectives, combining skill and expertise that spans the entire chiropractic wellness spectrum. Dr. Adams and his team are committed to bringing you better health and a better way of life by teaching and practicing the true principles of chiropractic wellness care. Patients seeking treatment with Dr. Adams, are assured of receiving only the finest quality care through the use of modern chiropractic technique and technology. Dr. Adams and his staff have a genuine focus on your total body health. Our office also offers massage therapy as a means to reach your optimum health potential. Our experienced massage therapists are trained in a variety of techniques including: Swedish, myofascial release, deep tissue, lymph drainage, reflexology, and cupping. If you are new to our website, please feel free to discover and learn about chiropractic care and wellness. If you are interested in starting your journey toward wellness please subscribe to our award winning newsletter. If you are already a newsletter subscriber, please explore the member wellness section of our website for wellness articles, resources, and health facts---specifically targeted by Dr. Adams to meet your wellness needs and interests. The Kitsap Sun Business Journal honored Dr. Cole Adams as one of the 20 emerging leaders in Kitsap County under the age of 40 for the work he has done within the community in 2016. 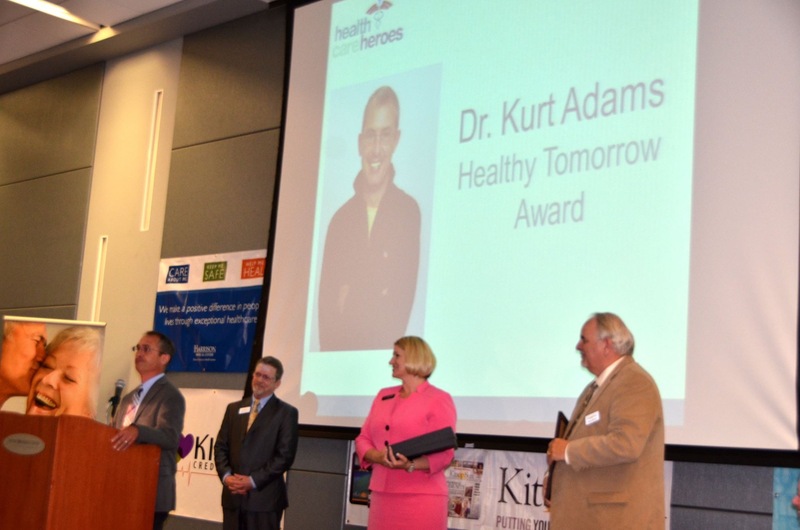 We are happy to announce Dr. Adams was the honored recipient of the Healthy Tomorrow award as part of the Health Care Heroes recognition program by the Kitsap Sun.